One recruitment trend that is already taking off, but sure to boom in 2018, is the concept of video job descriptions. It can be difficult for job seekers to get a sense of the company and position through a traditional job posting. Video job descriptions bring life to your otherwise bland job specifications that are often lengthy and lose attention. See why we think you should implement video job descriptions in 2018. Just like videos capture attention on social media, video job descriptions stand out through all the online clutter and command attention. Many companies have moved toward them already, but not as many as you would think. According to TheLadders research, job seekers spend just under 50 seconds deciding if they like a job post. A well-done video will capture and keep attention longer than the written job posts your competitors are posting. It’s a challenge to describe the culture and environment of a company in a written job description, and a lot of companies don’t have much about culture to begin with. 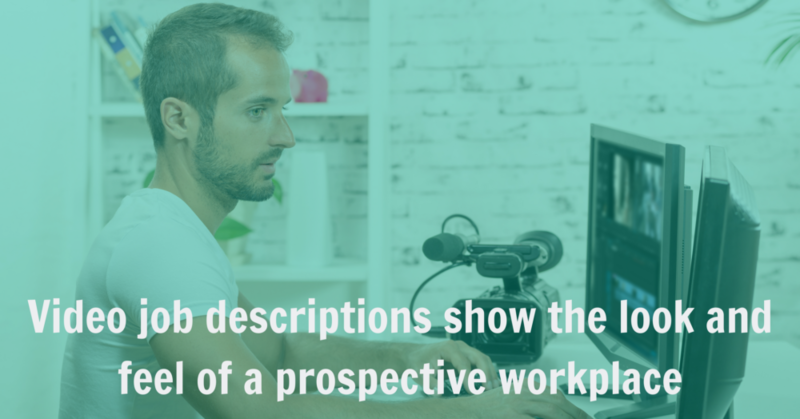 A video job description can visually show a workspace, work duties and can even show employees giving testimonials for their company. In an industrial setting, the visual component can make or break a job applicant. If the facility seems safe, clean and manageable, job seekers are more likely to apply. Showing the building from the inside helps create a connection to the company and stand out from other openings. Industrial job seekers want to know what they’re getting into. By seeing footage of current employees working, they will have an idea if they are still interested in the position. This can save time receiving applicants that in the end, won’t be right for the job. Making sure the footage includes the small details of an employee’s job on an assembly line or packing in a warehouse is important so that others can put themselves in those shoes when making a decision to apply or accept that same job. If they are still interested after seeing footage of a general day within a facility, the chances of them being a good fit for the position is high. After watching a job description video and applying for the job, a candidate has a much better working knowledge of the company. This especially important in the industrial field where job descriptions can be almost identical, but cultures vary significantly. Candidates enter interviews with a better knowledge of the company and expectations of the job. If the manager conducting the interview films the video job description, the candidate will also have a sneak peek of the interviewer’s personality, which can help match talented candidates to the right role. If your company hasn’t started video job descriptions yet, now is the time to add it to the 2018 calendar. Using video job descriptions will help fill jobs quickly and more effectively. If your company is looking to fill positions, contact an Alliance Industrial Solutions recruiter.